Phoenix Women Chorus Singers heading to the stage. Do you want to sing and can match pitch? Do you believe in the empowerment of women, promoting diversity and tolerance, and the power of the universal language of music? You are perfect for Phoenix Women’s Chorus. Phoenix Women’s Chorus does not require auditions! Our singing members include all levels of musical abilities – from beginners to absolutely amazing. Everyone is welcome. 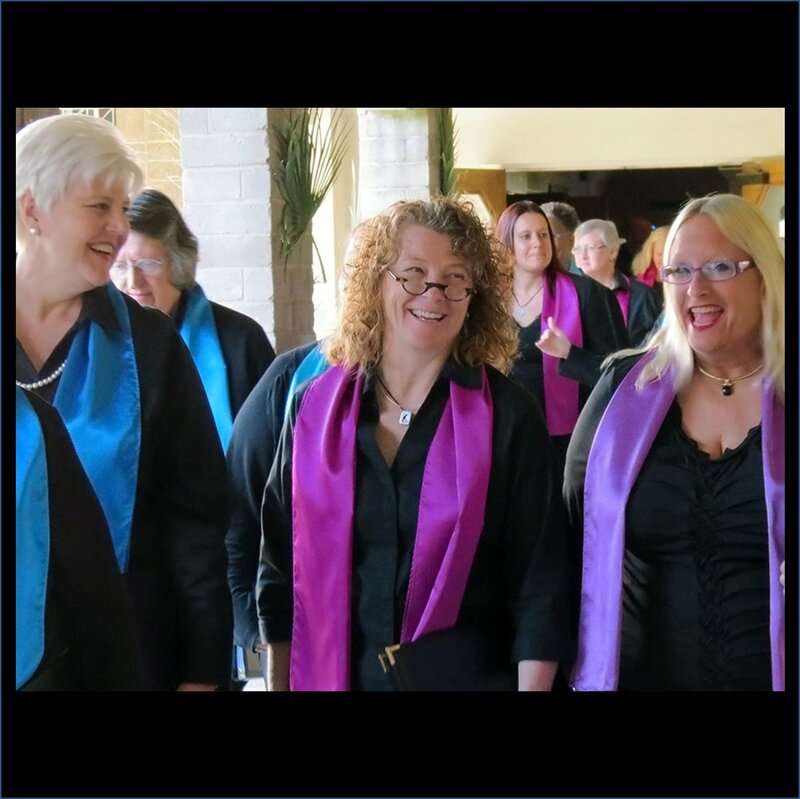 Join a diverse chorus that welcomes all women, and represents wide ranges of age, voice types, and musical expertise. Build your repertoire of choral works in traditional, contemporary, and classical styles, with roots in social justice. Sing four full-length concerts each year in the spring and the fall and perform at several community events and fundraisers throughout the year. Build and strengthen your sisterhood community of like-minded women. Contribute in a wide variety of community activities, such as festivals, charity events, ceremonies, and sporting events. Perform on national and international stages through our Gay and Lesbian Association of Choirs (GALA) membership. New singers are welcome to check us out for three open rehearsals in January and August. We rehearse every Tuesday, 6:30-9:30pm, with a 4-week winter break and an 8-week summer break. check our calendar for the next open rehearsals! Gift Your Talents as a Volunteer! Volunteer at a concert: Greet patrons, take tickets, hand out programs and assist with seating. Volunteer for a fundraising effort: Share your ideas, work with a devoted fundraising team, and contribute at fundraising events. Volunteer for a marketing event: Work at festivals booths, help at sporting events, and support singers at special performances. Volunteer your business talent: Contribute your gifts, skills, and talents to strengthen the Phoenix Women's Chorus non-profit business. Annette Overholt preparing to nourish our Singers at a Phoenix Women's Chorus Dress Rehearsal. Featured: Haley Ritter, ASL Interpreter. Haley's talents have allowed us to reach an often forgotten audience within our community. We have retained Haley's services for over a decade through our Donors' generosity. Phoenix Women’s Chorus Donors play a vital role in sustaining one of the Valley’s greatest treasures. The magic of our organization is in the performances of the talented voices of our choral members, the support we provide to the lesbian, gay, bisexual and transgender (LGBT) community, and our message of empowering women, promoting diversity, and teaching tolerance through the universal language of music. Ticket sales and membership dues alone cannot cover our operating costs. Your generous gifts help us purchase new music and retain our talented staff. Donations from our patrons sustain the day-to-day operations of Phoenix Women’s Chorus, which is a 501(c)(3) non-profit organization. Your support at any level is makes a difference. Help us continue grow, celebrating the accomplishments of women in music. We have many convenient options for you to make your generous gift to Phoenix Women's Chorus. Explore the options to determine which one it your best fit.